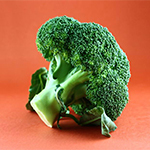 BUGS in the gut help the body unlock the health-giving properties of broccoli, research has shown. Bacteria in the lower gut enable the vegetable to release the cancer-fighting agent sulphoraphane, scientists believe. "This discovery raises the possibility that we will be able to enhance the activity of these bacteria in the colon, increasing broccoli's cancer-preventive power," said nutrition expert Professor Elizabeth Jeffery, from the University of Illinois, in Urbana, US. She said people destroy the plant enzyme that produces sulphoraphane by overcooking broccoli. "Now we know the microbiota in our digestive tract can salvage some of this important cancer-preventive agent even if that happens," said Prof Jeffery. Her team made the discovery after carrying out tests on rats. Sulphoraphane, which has anti-inflammatory properties, is said to be a potent anti-cancer agent.